Aside from the fact that she already has a gold record in her arsenal and performed on some of the biggest stages in country music, Julie Roberts is the epitome of what a true artist should be. She loves her faith, her family and her fans. She’s also involved in nearly every aspect of her music. From writing songs and recording new music to building her brand and physically taking autographed CDs to the post office to mail, the beautiful songstress totally believes in her purpose. Now, Julie’s about to celebrate her birthday by doing something she’s never done before. On Friday, February 1st at 10pm EST, Julie will be broadcasting an intimate concert performance via the Internet on StageIt. Think of StageIt as an online concert venue. One where artists broadcast LIVE interactive performances directly from a laptop or computer to fans all over the world; offering a totally unique concert experience that you can’t get anywhere else. Fans can log on and tune in from the comfort of their own home from anywhere in the world and see Julie perform her signature hits as well as new music she’s currently working on. I had the pleasure of speaking with Julie and getting more info about her upcoming StageIt show as well as her new music and plans for 2013! How will the StageIt show be different from other ones you’ve done? The show is done via the Internet and is very intimate. I’ll be performing the show at a really cool venue I discovered right before Christmas called The Music Loft. I’ll be there with my guitar player. The cost is $5 and people can sign in from anywhere. What can fans expect to hear at the show? I’ll be playing some new music that I’ve been working on as well as performing some of the songs everyone knows and loves. There will also be a live chat as well. I’ll have someone there monitoring the session to let me know what everyone is saying and what songs people would like to hear. It will be fun. This will be my first time doing one of these shows, so I’ll learn a lot from it. I may even try doing them on a regular basis. Even from the studio or from my home. You’re also working on new material for an album? I am. I have about half of a new album completed. I have a lot to say and I’m really excited to get it out. I’ve also started a new series on my website called ‘Naked Series’. These are songs that I’ve written or loved that are stripped down with just one or two instruments and my voice. What is your process for writing songs? Every song is a little bit different for me. A lot of the songs I write are based on what I’m going through in life at that moment. Sometimes, late at night I’ll come up with a melody line or an idea. It might be something that I’ve been thinking about for a long time that would make for a great song. What else do you have planned for 2013? I plan to release the new album project I’m working on and perform as much as possible. I’m really excited about getting back out on the road. I’ll also be involved in the National MS Society this year. I want to help bring awareness to it. I’ve had MS since 2005 and feel that raising awareness is part of my journey. There are so many people who don’t even know about MS or have misconceptions about it, and the Society helps so many people. These things all mean a lot to me. You’re such an emotional, soulful singer. Is there a secret to how you bring life to the songs you sing? I have to detach myself from life and become that song. For me, that’s what I think an artist does. You take the song and make it art. I feel most comfortable and “right there” when I can get inside of the lyric and become the song. It just comes naturally for you. I know that it’s my purpose in life. To be on this Earth, singing and connecting with people every night with my music. I love what I do. 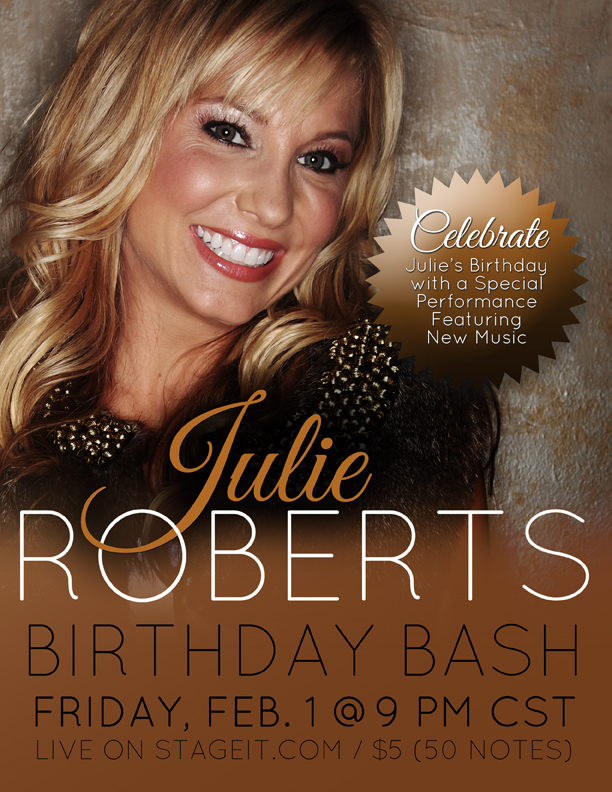 For more information on Julie Roberts’ Birthday Bash show on StageIt – Click Here! Article first published as Singer Julie Roberts Plans Unique Birthday Celebration on Technorati. Jim, how nice you still have this connection and what a cool idea this concert is. It was an experience I’ll never forget. I still have all the pictures from that night. She’s one of the nicest people you’ll ever meet… and that voice: WOW!